Welcome to my newly WordPressed blog. I’m still fiddling with some of the settings and I know there are still some bugs so things might move around a bit in coming weeks. Some links will still go to posts on my old Blogspot site (which is still entirely functional), but I’m going to work on fixing this in my copious free time. If you have any problems, suggestions, or complaints about the new site, please register them in the comments here! Hoffmann in Bregenz. Time marches onward. I wasn’t happy with the amount I wrote here this year–I saw a few great performances (and a few not great but interesting ones) that I never wrote up for reasons contractual, logistical, and existential. I’m less inclined to knock off a few paragraphs about parking and barking than I have been in years past. But I don’t want to sound too gloomy, because I think that what I lost in quantity I more or less made up for in quality. Blog-wise, snappy one-liners about the Met bring in the crowds–particularly compared to my specialty, 1,500 words about Regietheater from a part of Austria that few non-EU folks can find on a map*–but for me, this year offered better, more interesting material than the last few. This was in part because I was highly selective and selected things that I was pretty sure I was going to like. It worked out OK, as far as I’m concerned! Finally, what’s coming up? In the immediate future, Pearl Fishers plus some more Boston Symphony Orchestra with Renée Fleming, then Manon Lescaut and Elektra. I’m not planning on Roberto Devereux, but I do hope to make it to some opera in Boston. In the longer term, I’m thinking of moving this operation to WordPress because Blogger is effectively no longer under development and becoming unwieldy, but I predict this will be time-consuming and I don’t know when I will do it. Also, I will be writing a bit about a new class I’m teaching at Smith this spring: a history of opera and women from Traviata to Lulu! The Bernstein Mass in Philadelphia. It’s not a mass, it’s not an opera, who knows what the hell it is? I don’t think that most of it is very good. But I became sort of obsessed with it. (As did everyone else in my then department–almost all of us saw it and felt an unusual urge to talk it over with each other. Repeatedly. And we had to pass around the score around, because the library only has one copy.) It’s a pungent historical artifact and still powerful, relevant for many of exactly the same reasons, and kind of shocking. 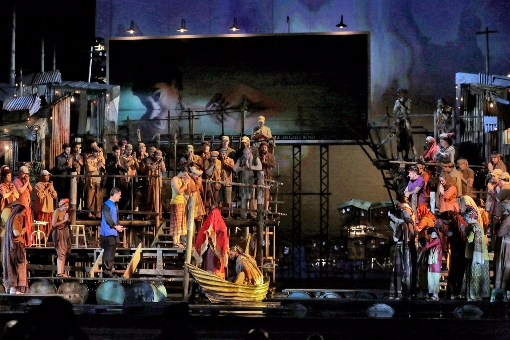 Aleksandar Denic’s sets for Der Ring des Nibelungen in Bayreuth. This cycle left me with less than I had hoped (see below) but the sets were absolutely amazing in their detail, both hilarious and grotesque. The newspapers, Lulu. I wasn’t quite as big a fan of this production as most people, but I love the way it deployed newsprint as symbol. Guillaume Tell, which became famous as shock theater, was a very powerful performance which I was fortunate to see. It wasn’t consistent or even coherent, but it was serious and took the piece very seriously. Also, Gerald Finley has never been better, and he sets a very high standard. I was proud of what I wrote about it for the New York Times, but that wasn’t the place to make a critical statement. So here it is, late. The Ring in Bayreuth left me conflicted. I didn’t end up writing about all of it here because I did a piece on it for the New York Times (and then I moved from Pennsylvania to Massachusetts the following week!). I liked how earthy and strange and raw it was, and how genuinely funny. It had a weird emotional payoff that happened when you least expected it. But the acting was spotty, the symbols vague, and the whole thing misogynistic. And it didn’t stick with me–I took lots of notes but didn’t find myself thinking about it often compared to most of what I saw on the same trip. Trovatore at the Met. I went to this and I wrote about half a review which I didn’t post. It was a very emotional performance, but I didn’t feel like I could write about it in the effusive way it seemed to demand. I wasn’t touch with my fan self that weekend. Exotica. I spent a lot of time this year thinking about and writing about how opera represents its others, from blackface to Turks to Delibes’s fromage-y Lakmé to a Turandot involving the Great Wall, clay soldiers, and every single other cliché. I don’t want to be a scold and I get tired of writing these things sometimes (especially when I saw most of those in the space of two weeks) but I’m not going to give up on this. The power dynamics are real and also very complicated. Operas About Famous Dead People. 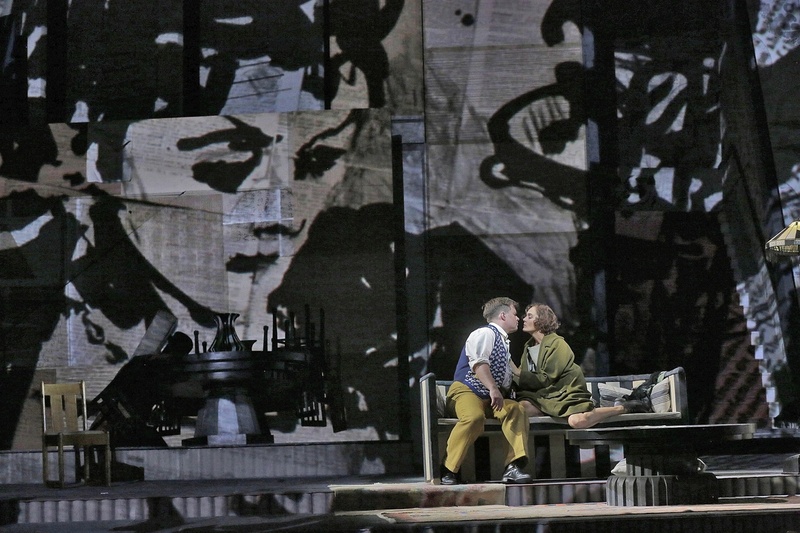 Opera Philadelphia did two big new operas! Great move. Unfortunately both featured more dull monumentalizing than story. At least the second, Yardbird, however tepid its drama, featured an original, intriguing score by Daniel Schnyder. Not Much Met. I had a hit with my pie chart analysis of the Met’s programming. But I only saw a handful of productions at the Met in 2015. I missed a few that I would have liked to see, most grievously the Iolanta/Bluebeard double bill, but I wish there had been a few more that would have inspired me to get on the train/bus to go to New York. (Remember: it takes me four hours to get to New York these days! And that’s four hous on a Peter Pan bus.) And some of what I did see didn’t make this list. Hopefully next season will be better! I still am really looking forward to Elektra and have some hope for Manon Lescaut. *In March I’m giving a talk on this production–which, if you didn’t follow the link, is the Herheim Hoffmann–at the American Comparative Literature Association’s conference at Harvard!